You go to charity galas, you end up buying things. Gail tends to buy admission to wine tasting parties she isn’t really interested in because she doesn’t drink red wine. I buy classes for things I don’t know much about. 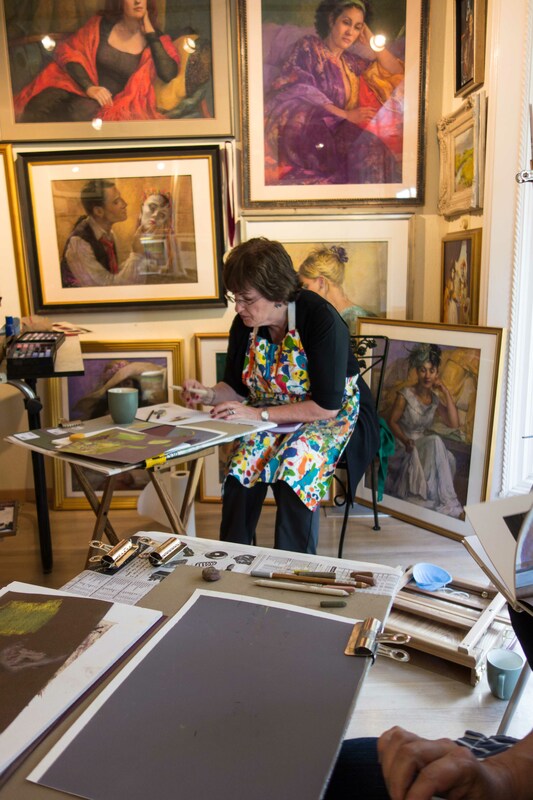 Today, I went to the home of Ruth Hussey, a nationally noted pastel painter, for a class on pastels. I”m still not an artist, but it was fun. Pastels are sticks of solid pigment you apply like chalk or crayons. Some of them are very hard, so you can draw thin lines. 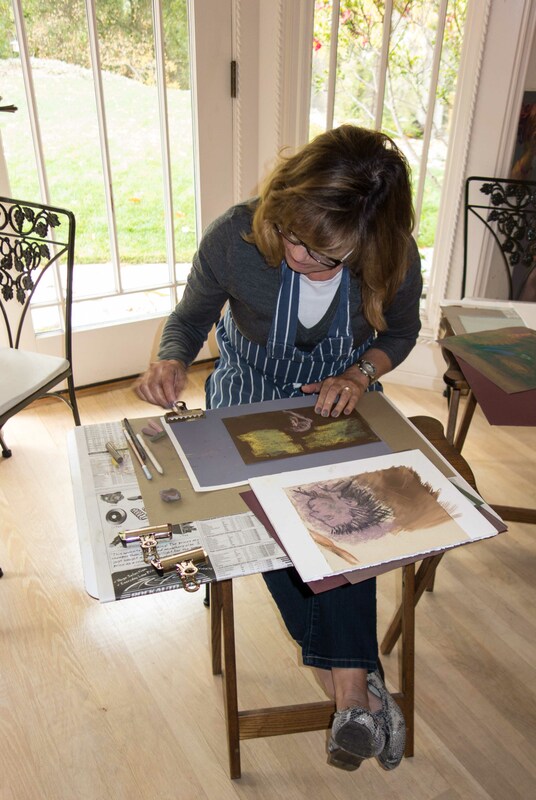 Some are as soft as butter, spreading pigment smoothly over the paper in broad swaths. The colors are not necessarily the soft, desaturated tones of the easter bunny; they can be as intense as you want, if you have good technique. Technique is what we were there to learn. There were 4 of us. Me, BJ Ledgerwood, Lassie and Loretta. The latter two are already awfully talented artists, BJ and I are learners. We all learned how to use, apply, blend, smooth, smudge and fix this interesting art medium. 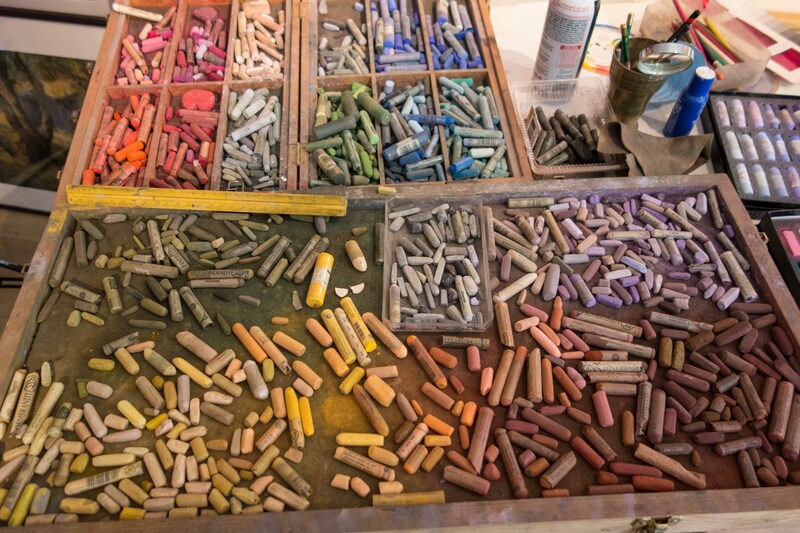 Just one of Ruth’s boxes of pastels. It isn’t just the pastels, the paper itself is critical. Too smooth, and the pastels won’t spread or cover. Too rough and you can’t get the smoothness you want. The amount of roughness in any particular paper is called the ‘tooth’. I was particularly interested in the ‘sanded’ papers, which are actually like 300 grit sandpaper. You can put a lot of pigment on those papers, and get some really deep effects in the color. 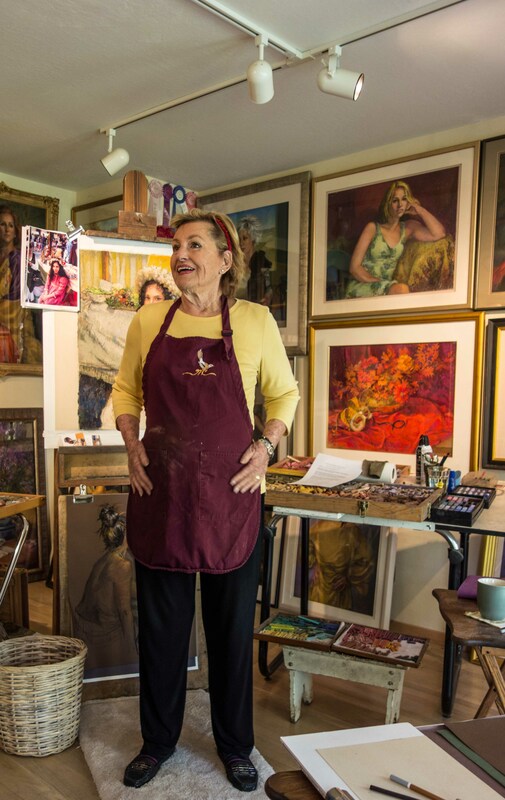 Lassie working in front of yet more of Ruth’s work. Ruth talked for about 90 minutes, laying out the basics of pastels, then we drew. She set up a small still life and everyone else began making a drawing. I was working on copying one of the portraits from the walls, and just kept playing with it. The draftsmanship is ghastly, no I won’t show you, but I did finally manage to get some of the colors the way I wanted them. The secret to this medium is to layer colors over each other, building up the depth and variation that really exist in nature. Nothing is really just one color, look closely and you will see a myriad of colors, shades, tones and hues. How does the light hit the object? What is the color of the light? It goes on and on, and the great artists know how to recreate this. Ruth teaching. 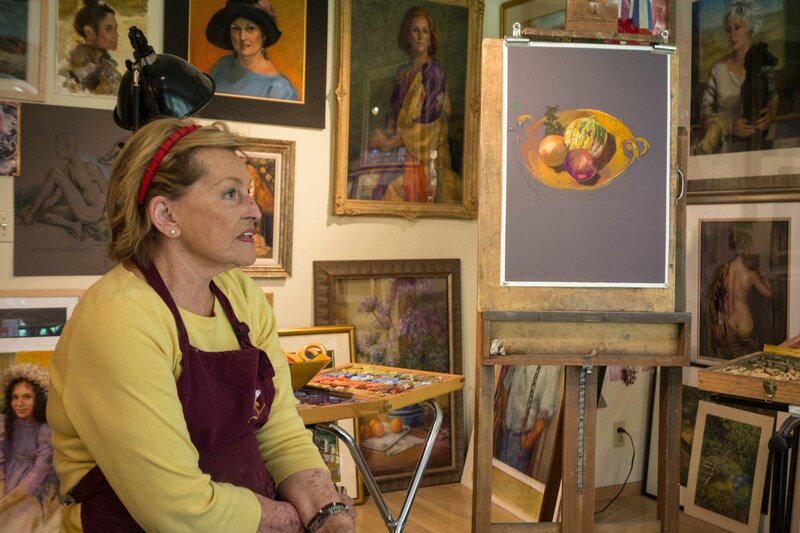 The drawing on the easel is the still life she drew, while talking and helping the rest of us. The three hours flew by, we all learned a huge amount and yet barely scratched the surface of how to create beautiful pastels. Ruth is a better teacher than I am a student, and still I thought the class was wonderful, entertaining and educational. This won’t make me a pastel artist, but perhaps it will help me get more and better color into my photographs. BJ will use her new skills to create better landscape design drawings. The Ruth Bancroft Garden will use the money to continue to be a world class succulent garden right here in Walnut Creek. Pretty much a perfect day all around. This is another paper for pastels from the French manufacturer of art supply products, including pastels, paints, and papers. It is a light-weight (45 lb.) paper with a very fine, even tooth that allows for blending and rubbing of colors and for heavier layering of pastel or crayon strokes. I’ve only found this paper in a single size in a spiral-bound pad measuring 9-1/2″ x 12-1/2″. The pads contain five colors that serve as a nice ground: light cream, dark cream, felt blue, light gray, and medium gray.